Scott Winchester is a meticulous craftsman. He makes everything to the highest standard he knows how. You simply need to look at his final product to know that he’s not one to cut corners and is willing to spend the time it takes make something to the quality he wants it to be. Although he hasn’t been a member for long Scott dove right in at Port City Makerspace as an instructor and the inaugural member of our Space Cadet Volunteer program and single-handedly mans the shop most sundays. 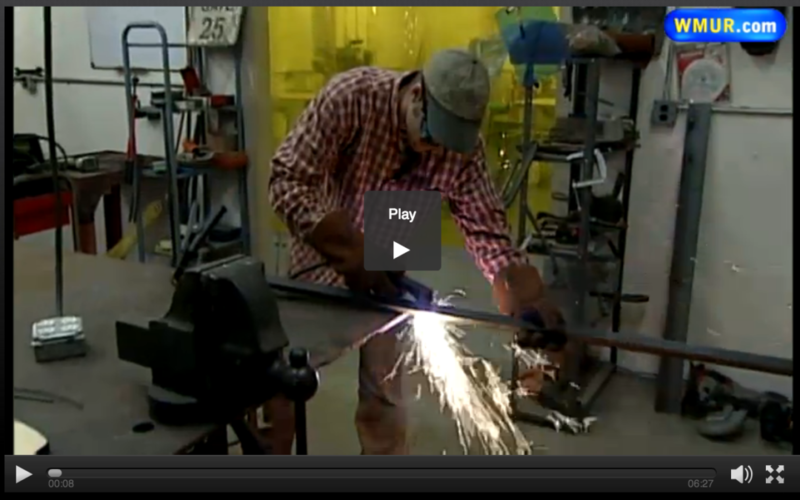 Scott teaches our blacksmithing and forging classes and our tool sharpening classes. You can find his work on etsy under the username Stonewind. Get your friends and loved ones a gift that keeps on giving. A membership to Port City Makerspace will feed their creative drive and help them follow their desire to create things. Gift memberships are available at any membership level and for any amount of time. Gift daypasses are also available. Tanya Hakala of Dover has always been crafty and interested in DIY projects, but she’s been limited to using small hand tools and other supplies that she can store in her home. She doesn’t have the space in her house for, say, an embroidery machine. Not many people do. Portsmouth’s West End is the frontier of the Portsmouth scene. Come celebrate with the key players who keep the area weird at the second annual West End Harvest Festival. Besides Port City Makerspace you can expect a showing from Toboggon, Farmhack, Seacoast Robotics, Port City Peds, and more! See demonstrations on activities in all of our shops plus special demonstrations from our partners and members. Fall Harvest is about making things to get you through the long New England winter, so what better place to have a harvest festival than Port City Makerspace? Come join us in the celebration of cultural ingenuity and regional craft as we make apple cider in our hand crank press and celebrate the traditions of the fall season. This event is free and open to everybody. Food and Drink will be available for sale. We are pleased to announce another successful collaboration with the Portsmouth Halloween Parade. Port City Makerspace once again provided the music for the grand marshal and crew to dance their way along at the front of the parade. It was also our pleasure to host two costume making events this year in collaboration with the Portsmouth Halloween Parade. Paul st Pierre is stronger and smarter than you. A master machinist who bridges the generational gap between the old fashion technical mastery of analog and the complex technicalities of Computer controlled, Paul can do it all. Paul is a diligent craftsman who sits humbly in the corner working away on his projects until somebody thinks to ask him for help and then not only does he always have all of the answers but he usually drops what he’s doing to work on your project with you until you are unstuck and inspired. Interdimensional travel taking place at the makerspace as Paul pulls stepper motors and rails out of a 2D printer to build a 3D printer. Paul’s cool cargo bike he built. Portsmouth’s West End is the frontier of the Portsmouth scene. Come celebrate with the key players who keep the area wierd at the second anual West End Harvest Festval. Besides Port City Makerspace you can expect a showing fromToboggon, Farmhack, seacoast robotics,Port City Peds, and more! Donate to help us get our Auto Shop up and running! We have a great offer on a two post lift to install in our upcoming Auto Shop and we need to raise some funds to make it happen. Donate here using paypal and help us out in getting this great community resource started. We need $800 total to get it and get it set up but we need the first $500 quickly to buy this lift before somebody else does. We need your help to start a community bike program! Portsmouth could really use a community bicycle program, a place where kids and adults alike could go and learn to fix bicycles and have free access to parts that other people no longer need. Port City Makerspace has been in contact with the city of Portsmouth transfer station about starting to direct bicycles out of the trash stream, but what to do with all those bicycles? We are holding a brainstorming session about starting a community bike program on Friday Aug 30th 6-8pm. Anyone interested in participating in this or just interested in seeing it happen is invited to attend. Cindy Jones did a really great job putting together this little segment about us for a television spot that aired on Chronicle on WMUR 9. Unfortunately their video player is not embed-able so click the image below to view it!